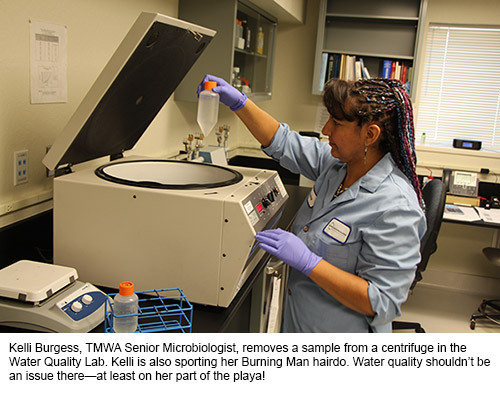 Led by Kelli Burgess, TMWA’s Senior Microbiologist, our lab team went through a very strenuous certification audit, conducted by the Nevada Division of Environmental Protection on behalf of the EPA. Method 1623.1 is very complicated and requires great attention to detail, which is why most water utilities send their samples out to third-party laboratories for analysis. At TMWA we prefer to conduct our own tests in order to have the most direct means possible to monitor our source-water quality. Though the Truckee River does provide an outstanding source of raw water, conditions can change significantly during the year, giving us everything from flooding to the very low flows we are seeing this summer. These fluctuations create equally dramatic changes in the presence of suspended particles and pathogens that we need to treat for. This is why such a rigorous testing regimen has been implemented. Obviously we at TMWA are very proud of this certification and gratified by the praise Kelli and her team has received for it. Even more important, we are glad for the additional validation that we are living up to our commitment to water quality excellence.